I know I need to drink more water...but sometimes I struggle with it....It's just so boring!! However, as we all know, there are lots of health benefits to drinking water, from flushing out toxins to aiding weight loss, so it's important to include it in our daily diet. I seem to drink more water when I'm at work, as I have a routine of filling my water bottle up at the start of the day and then I just carry it around with me everywhere. At home on days off is where the problem starts, instead reaching for teas and fruit juices. 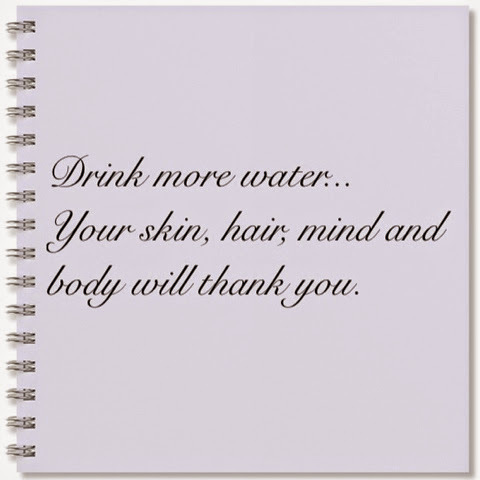 I thought I would share with you all a little tip that I have started doing recently to inspire and remind me to drink more. 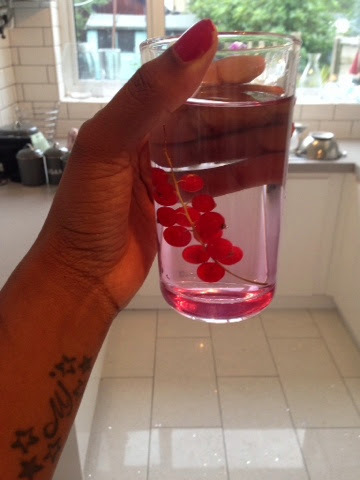 It makes normal plain water look more appealing and interesting, whilst adding some subtle flavour (below). I bought this beautiful glass water bottle with stopper a while ago from a Swedish company called Sagaform . Its a great conversation starter for the table when entertaining as it replicates the iconic design of the plastic water bottle with its ridged sides and can quite easily be mistaken for one until closer inspection! 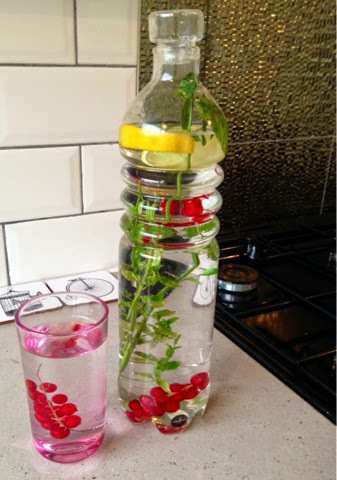 I thought I'd give my plain water a bit of a 'Mojito' cocktail feel by adding sprigs of fragrant wild mint, Cranberries on the vine and freshly squeezed lemon. 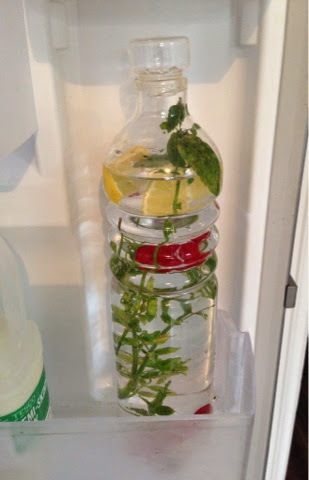 The mint really flavours the water along with the lemon. The cranberries are just there for decoration! - although they are quite a nice welcome surprise when one plops into your glass! Kept in the fridge. 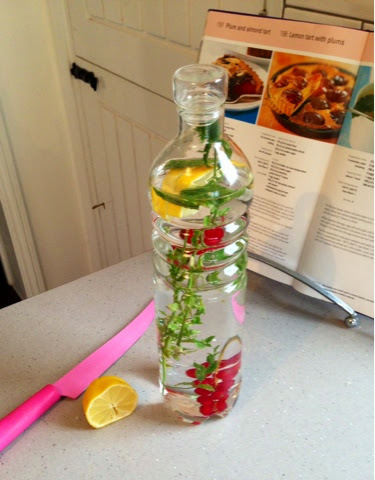 so it's nice and ice-cold, this is a perfect refreshing summer cooler and hopefully will make you reach for the water bottle more! How do you make your water more interesting?